I am deeply drawn to the figure of the Black Madonna: mysterious, powerful, earth goddess, Kali, mother of God, mother of creation. 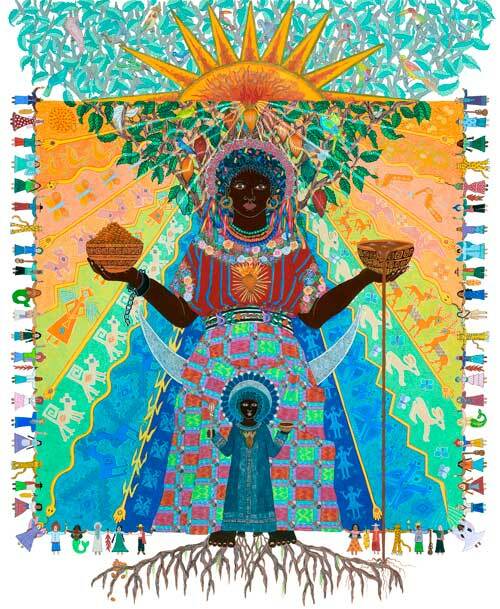 I envisioned a Black Madonna of cacao, sacred drink of ancient Mesoamerica. Within her lies the dramatic confluence of cultures that brought chocolate to the world: the first cultivators in southern Mexico and Guatemala, the Spanish conquistadores who brought chocolate to Europe and the African slaves who labored in cacao plantations. I created a personal blend of Christian, Mayan and African sacred symbols combined with images of chocolate. The Black Madonna is an African figure of great spiritual power. Her life force is expressed in a cacao tree that is both deeply rooted in the earth and whose branches reach into the heavenly realms. The tree teems with birds from the rain forests in which cacao trees grow. I was inspired by designs from traditional Guatemalan Mayan textiles for the goddess’s clothing and for the background figures streaming down among the sun’s life-giving rays, uniting heaven and earth. Cacao pods halo the Madonna’s head. The pods represented the human heart in ancient Mesoamerica, so they also form the Sacred Hearts of the Madonna, the holy child, and the life-sustaining sun. Bowls of cocoa beans and liquid chocolate spill onto the earth, thus the all-giving Madonna nourishes the world with food from her own body. The child’s scepter is a molinillo, a Mexican chocolate stirrer. The Madonna’s animal, human, oceanic and celestial children are modeled after Guatemalan worry dolls. Some hold the chilis and corn used to flavor sacred Mesoamerican chocolate drinks, others carry molinillos, and yet others hold candles, reflecting the light of the Divine that every living being carries within. The new museum in Hershey Park in Hershey, Pennsylvania has acquired a print for their collection. Original painting: 14 x 21”, Gouache, iridescent watercolor, and 23K gold leaf on paper. Contact the artist for pricing.